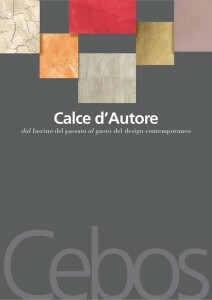 GLAZES.METALLIC FINISHES.POLISHED PLASTERS.LIME BASED PRODUCTS.MATERIAL EFFECTS. Cebos Color produces a wide and complete range of high quality paints and coatings to create, easily, amazing decorative effects. Polished plasters, glazing, metallic and multicolour finishes: all Cebos Products are studied and manufactured in Italy, in accordance with the most severe environmental and ecological norms, and continuously enriched with colours and effects to anticipate market trends.